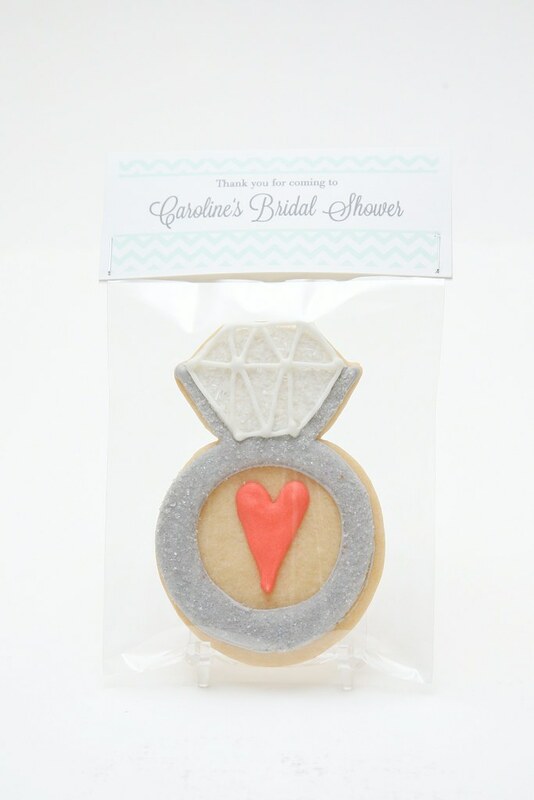 These cookies are a new & improved version of the "diamond ring with floating heart" cookies I made for a previous bridal shower as part of my 'Bonne Amie' Cookie Suite. 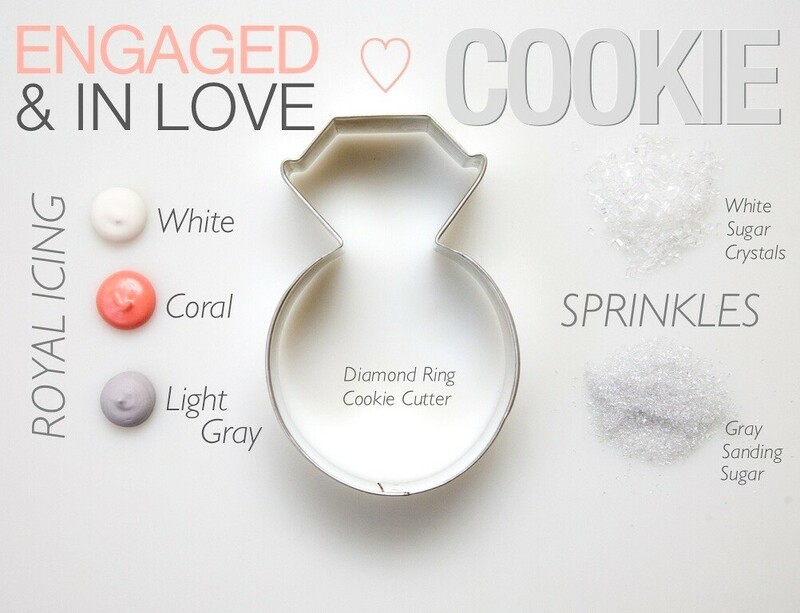 This time around I'm calling them "Engaged & In Love" cookies because, you see, there is a heart inside the engagement ring. I know, I'm really clever. 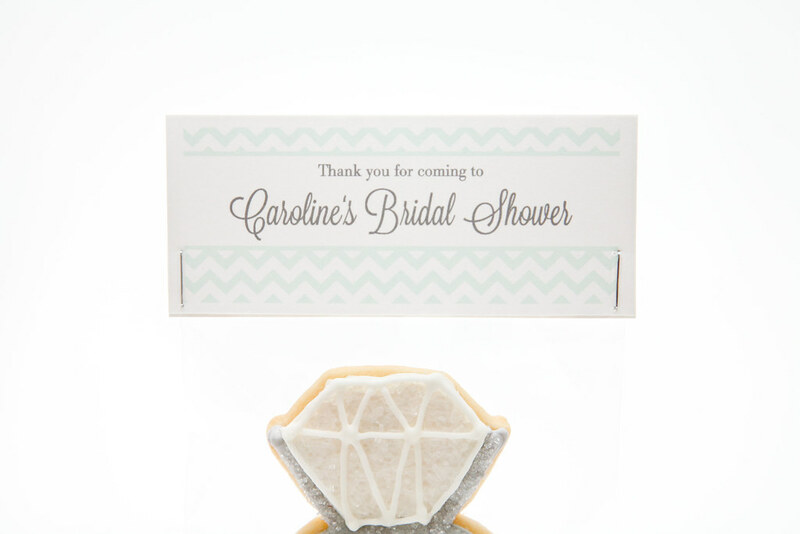 I got a request from a high school/hometown friend, Mary Kate, for bridal shower cookie favors for her friend. Mary Kate basically gave me complete freedom to pick out the cookie, colors, and tag design. I truly love working with people who have a very specific vision, but sometimes it's equally awesome for someone to say "whatever you think is best"! Either way, I really just want to hit the right note for whatever & whoever the celebration is for. 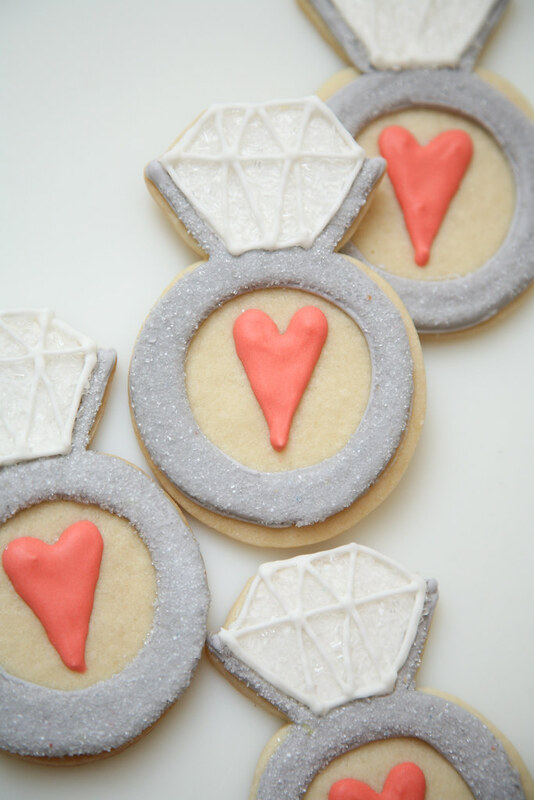 I went with the Diamond Ring cookie because it's kinda "hot right now" according to Pinterest. For some reason it's been repinned a lot -- relative to my other Sweet Kiera content on Pinterest -- over the past week. (This is my own self-indulgent blog traffic stalking, but if you are curious too, the top three pins this week that have been bringing visitors to my website are as follows: pin 1, pin 2, pin 3). So, I decided to make these ones for Mary Kate's friend, but made a slight change in icing colors. I felt like the ballet pink heart from the 'Bonne Amie' cookies could be kicked up a notch, so I made it more of a "hot coral" since it's a summer of bright colors. For the tags, I went with a "mint chevron" border and a lush, smooth font. The intent was for the overall look to be a little playful, a little preppy, but still simple & cool.